Haiti Rocked By Magnitude 7 Earthquake Near Capital; Catastrophe Feared : The Two-Way The US Geological Survey is reporting a magnitude 7 earthquake near Haiti's capital of Port Au Prince. 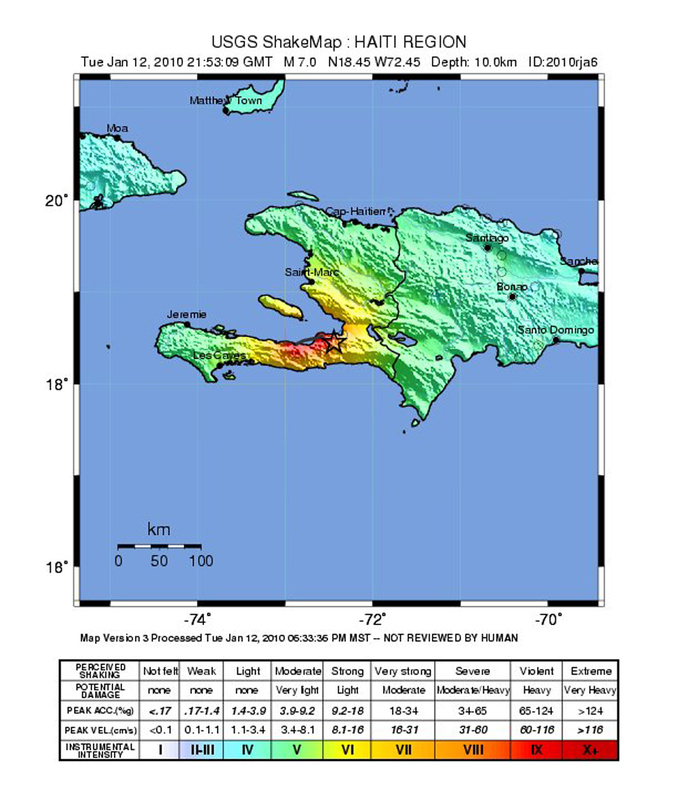 The U.S. Geological Survey is reporting a magnitude 7 earthquake near Haiti's capital of Port-au-Prince. The U.S. places the epicenter 10 miles southwest of the capital. Unfortunately, the earthquake was relatively shallow at about 6.2 miles below the earth's surface. Generally. the shallower the earthquake, the worse the shaking and damage it causes. A tsunami warning has been issued with other Caribbean islands being told they could be in the path. Haiti, the Dominican Republic which shares the island of Hispaniola with Haiti, Cuba and the Bahamas have been warned. There are reports that a hospital has collapsed. Haiti is the Western Hemisphere's poorest nation and does not have the search and rescue resources to deal with a disaster of this magnitude. We'll be updating this story through the evening. Be sure to hit your "refresh" button so that you'll see our latest updates. Update: 5:43 pm ET — Haiti's ambassador to the U.S., Raymond Joseph, has told CNN that he spoke with a friend in Petionville, a suburb of Port Au Prince, the capital, and his friend reports many collapsed homes and buildings. Joseph is clearly shaken and says that he had feared that because of the type of flimsy construction, houses built on the sides of hills "it was a catastrophe waiting to happen." Meanwhile, the USGS has reported that two aftershocks of magnitude 5.5 and 5.9 which would add to this disaster's destructive power. Update at 5:54 pm ET -- Frank Williams, national director for the aid organization World Vision, is also talking with CNN. He is in Petionville, a Port Au Prince suburb and reports that walls of buildings have fallen into the streets making them impassable for his staff as they tried to leave their headquarters for other parts of the area. He reports a lot of people wailing in the streets. He also said a worker at the presidential palace reports damage to that building. It's getting dark in Haiti and he said he's worried about the possibility of looting, "opportunists" as he called them. No further details on any casualties or other damage were immediately available. "Everybody is just totally, totally freaked out and shaken," said Henry Bahn, a U.S. Department of Agriculture visiting Haiti. "The sky is just gray with dust." Update at 6:21 pm ET -- The CIA World Factbook has good background information on Haiti. The national population is about 9 million people. Port-Au-Prince has about 2 million people and because the earthquake was near the heart of the metropolitan area and the inferior construction of much of the housing, the fear is that there will be very significant casualties. Dr. David Wald is telling CNN that the concern is about shaking and less tsunami since this was a "strike slip" type of earthquake and not an "uplift" earthquake. "My thoughts and prayers go out to those who have been affected by this earthquake. We are closely monitoring the situation and we stand ready to assist the people of Haiti." Background information: The President was informed of the earthquake at 5:52pm. The President asked his staff to make sure that embassy personnel are safe, and to begin preparations in the event that humanitarian assistance is needed. The Department of State, USAID and the United States Southern Command have begun working to coordinate an assessment and any such assistance. Update 6:44 pm ET -- Ian Rodgers of Save the Children told CNN that electrical power is off. He said his organization's compound is damaged and that it's one of the better built. Water is in STS offices so Rodgers and his people can't go in because of fears of safety hazards caused by water and downed electrical cables. As we heard from another manager of a charitable organization, workers are unable to get to their homes because the streets are blocked with rubble. He also expressed concerns that rescues will be hampered by the darkness and the poor security situation, raising the possibility that unknown numbers of people could be trapped by damaged and destroyed buildings until daylight. But there were growing reports of mass destruction — a hospital is believed to have collapsed, along with a section of the National Palace. Haitian President Rene Preval is said to be seeking safe haven on the island, The Miami Herald has learned. ...Haitian businessman Georges Sassine, who was in Washington, D.C., on his way back to the island nation, told The Herald he spoke to his wife minutes after the quake. "She said, suddenly her car started shaking, and she saw houses crumbling and she could not understand what was happening. And finally she understood," he said. He also spoke to Antwan Edmund, former head of the Caribbean-Central American Action. He told him "he was sitting in Port-au-Prince watching the mountain crumble." The quake rattled the U.S. Navy base at Guantanamo Bay, Cuba, just after 5 p.m. where there was no immediate report of damage or injury. "It felt like when a building shakes when a subway goes by. But I know there's no subway here and the island's not moving," said Army Maj. Diana R. Haynie. Updated at 7:04 pm ET -- The tsunami warning for the Caribbean was canceled by the Pacific Tsunami Warning Center at 23:45 UTC which would have been 6:45 pm ET. Updated at 7:15 pm ET — Mike Godfrey of USAID told CNN that when the earthquake occurred the shaking seemed to last for 15 seconds to 20 seconds though it seemed much longer to him. Things were coming off the wall of his apartment in Petionville, a Port-Au-Prince suburb. He made his way to the open courtyard and called for people in the building to join him where it was safe. Godfrey also reported that a minute after the earthquake a giant dust cloud rose up over the city of Port-Au-Prince and hung their for 20 minutes. He said it was an "amazing" site. He also reported that just before he got on the phone with CNN, he saw a large plane take off from the airport. That's significant since there was an American Airlines flight that was boarding just as the earthquake occurred. There is a flight from Haiti that is due to land in Miami at 8:42 PM ET. Worldvision said it's lost contact with its people on the ground in Haiti and is very concerned. Update 7:44 pm ET -- The State Department has briefed reporters, telling them that the embassy in Port-Au-Prince survived the earthquake. But the deputy chief of mission reported back to the State Department that he saw destruction and casualties because he was on the streets after the earthquake. The embassy has been unable to reach Haitian officials. Secretary of State Hillary Rodham Clinton has announced the U.S. government will provide assistance as quickly as possible. Update at 8:30 p.m. ET: The Miami Herald reports that "the American Red Cross was poised to move aid from a warehouse in Panama — blankets, kitchen sets and water containers for about 5,000 families — as soon as a flight or means of delivery could be found, said Eric Porterfield in Washington D.C."
Meanwhile, the social media sites are all over the story, as you might imagine. "Haiti" is the No. 1 "trending topic" on Twitter. At Picfog, many photos said to have been taken in Haiti today are showing up — but beware, several have already been debunked because they're photos taken in other parts of the world after previous quakes. Sticking with technology for a minute, Skype is turning out to be one of the more useful ways for the news media to get information about what's happening. CNN just wrapped up a Skype-enabled interview with an aid worker who's in Haiti (he's about 80 miles away from the epicenter, so didn't have too much direct knowledge of the damage, but could still relate some of what it was like to feel the shocks). Update at 8:40 p.m. ET. Earlier this evening, Haiti's ambassador to the U.S., Raymond Joseph, spoke with All Things Considered's Robert Siegel. The ambassador said the reports he's getting warn of a "major catastrophe". Some houses, he said, have "collapsed like cardboard". Update at 8:55 p.m. ET: Just before the connection was cut off, a man speaking via Skype with CNN (who said his home is just outside Port-au-Prince) described a body he said he'd seen. It was a woman who had been buried and "had blood coming out of her eyes, nose and ears," said the man, identified as Jonathan de la Durantaye. A moment ago, NPR's Michele Kelemen forwarded us an e-mail from the U.S. Agency for International Development, which says it is "dispatching a Disaster Assistance Response Team (DART) and has activated its partners, the Fairfax County Urban Search and Rescue (USAR) Team and the Los Angeles County Search and Rescue Team. The USAR teams will be composed of up to 72 personnel, 6 search and rescue canines and up to 48 tons of rescue equipment." Update at 9:11 p.m. ET. An information line: NPR's Michele Kelemen tells us the State Department has set up a toll-free phone number "for Americans seeking information about family members in Haiti." It is: 1-888-407-4747. Because communications into and out of Haiti are difficult at this time, though, State cautions that information may be limited for a while. Update at 9:40 p.m. ET: NPR social media guru Andy Carvin has set up a Twitter list of a few selected feeds with information about what's happening. Update at 9:55 p.m. ET: It looks like Richard Morse, a musician with some following for his work with the band RAM, is tweeting from his hotel in Haiti. "People in large numbers are singing prayers downtown" he wrote earlier. people sitting in the streets, with nowhere to go," Rachmani Domersant, an operations manager with Food for the Poor, told Reuters. -- This live UStream broadcast — mostly in French, but with some English translation in audio and an adjoining chat box — has been showing live conversations with a man in Haiti. -- The creator of this Facebook page is trying to gather information about the locations of aid facilities in and around Port-au-Prince. Update at 10:45 p.m. ET. We're going to close up this post. The Two-Way's coverage of the crisis in Haiti will resume early Wednesday morning — and of course NPR.org and NPR's newscasts will stay on the story overnight. The largest earthquake to hit Haiti in more than 200 years rocked the Caribbean nation Tuesday, collapsing a hospital and heavily damaging other buildings. U.S. officials reported bodies lying in the streets and an aid official described "total disaster and chaos." Update at 7 a.m., Jan. 13: We've updated the grim news here.